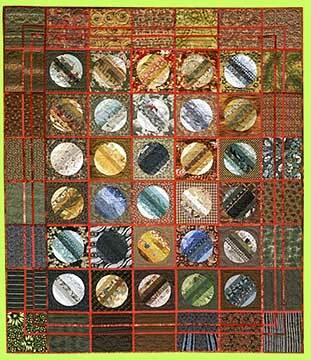 My quilts are colorful, graphic, vibrant and joyful!! I use color and texture to explore the glories of nature. Realism or abstraction are used as befits a theme or concept. I enjoy the challenge and excitement of translating my vision into quilts through a rich variety of fabrics, gilding and embellishment. I find such joy in being able to express myself through quilting that I'm not comfortable without a needle in my hand. Quilting is my life's work and a wonderful one at that. The best quilt is always the next one.